Finland’s venture capital and private equity market has developed favourably. In relation to its GDP, Finland has in recent years become one of Europe’s leaders in the volumes of its early-stage venture capital financing, and some specific sectors in Finland are an attractive target for international capital. One challenge for Finland’s investment industry continues to be the meagre supply of private risk financing for later-stage venture capital and growth-stage companies. The channelling of international expertise and capital into Finland is also more restricted than in many other countries. We participated in over one-half of the €5m raised in venture capital financing rounds for growth companies between 2013 and 2015, either via direct investments or through our portfolio funds in Finland and abroad. 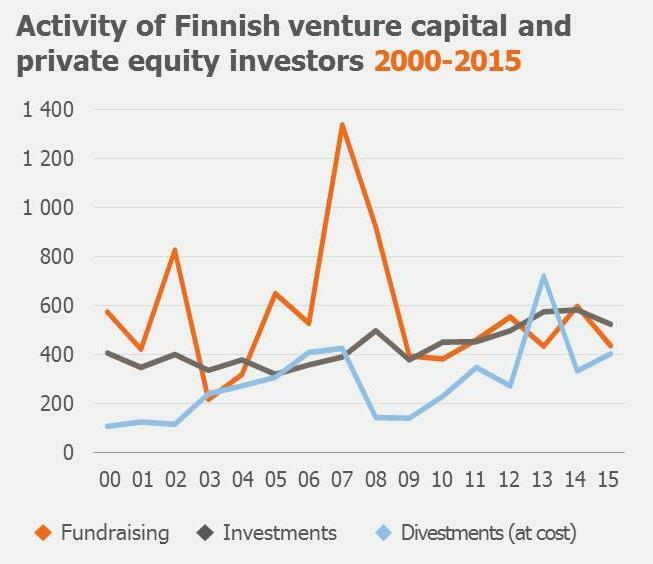 The preliminary annual data released by the Finnish Venture Capital Association (FVCA) indicate that Finnish investors’ activity in 2015 remained almost at the same high level as in recent years in respect of fundraising and new investments as well as exits. International players made several large investments in monetary terms in Finnish venture capital and later-stage companies, but in terms of the number of investments Finland received fewer international investments in 2015 than in previous years. The private equity and venture capital markets of the other Nordic countries, notably Sweden and Denmark, remained strong in 2015 although not quite reaching the same levels as in 2013-2014 in terms of overall activity. There were numerous profitable exits from all allocations of Nordic funds, and this was favourably reflected in Finnish Industry Investment’s result for 2015. Exits through IPOs have appreciably increased compared to previous years.